2014 Melonseed built by Brush Creek Yachts. 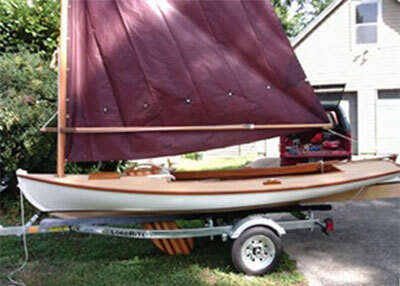 It is a beautiful wooden boat that has fiberglass cloth inside and outside. It sails just like a Crawford Melonseed. The sail is on a halyard so it can be raised or lowered on the water. 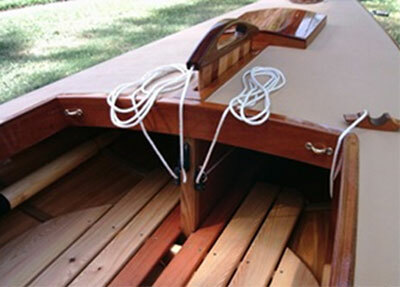 The boat is also designed to take a sliding seat for rowing. It does take slightly longer to set up than a Crawford Melonseed. I like the boat, but I want to trade up to a bigger boat. It is at a lake cottage in Lake of the Woods near Fredericksburg Virginia. I am a teacher from Pennsylvania, with summers off, which I spend at the cottage. Sail area 65 sq. ft.
2014 Galvanized custom fit trailer with 2" ball hitch. 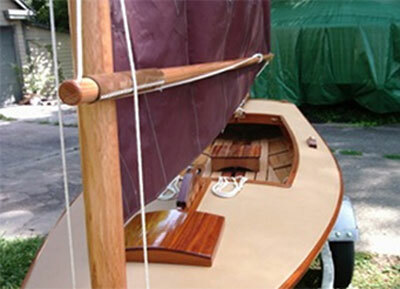 The sail halyard and sprit snotter can be hoisted and tensioned from inside the cockpit. The sail is hoisted up on the mast in a track. 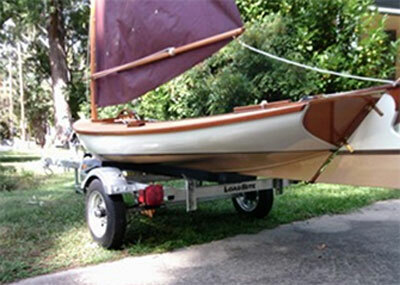 The boat can be launched with sail down and then hoisted when underway or the sail can be brought down within seconds when required. NOTE: that the boat will take slightly longer to rig than a Crawford Melonseed, because the sail is on a track with a halyard. The boat has been designed to attach to a sliding seat for sliding seat rowing.